Last Saturday I was beside myself at the Wolseley & District Museum Auction. 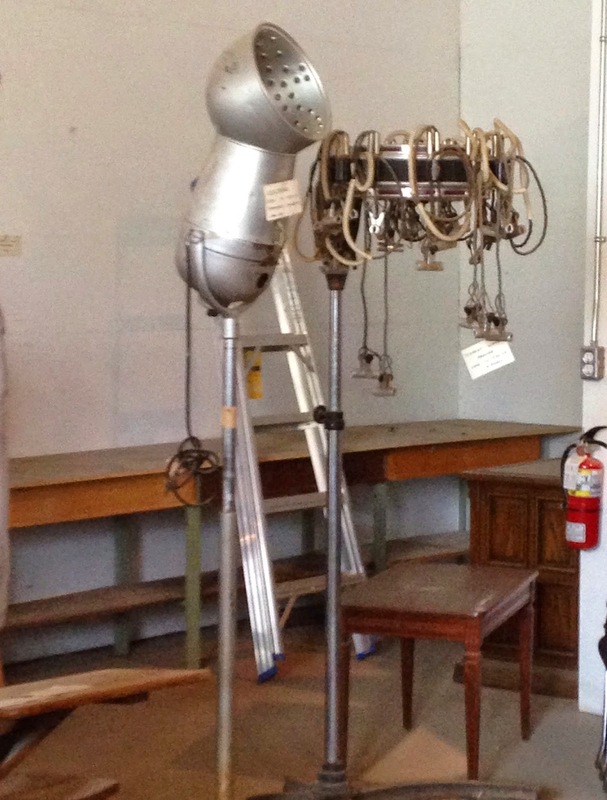 With a water problem in the basement of their old building, the museum sold the premises and was selling off duplicate, old and damaged, and unwanted items on their last day of ownership. 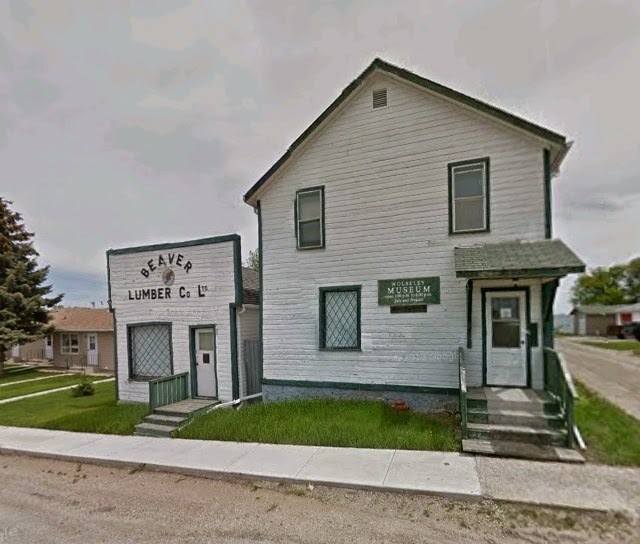 Actually, 3 buildings housed the museum with one being the original Beaver Lumber store, started in 1906, which eventually held a store in most Canadian communities. Because most of the museum items were donated, the board sent out a letter to everyone whose item would be placed in the auction, asking them to claim their item prior to the date. Unclaimed items would be sold at the auction. This was the reason given for some advertised items not being available. I had wanted to buy one of those items - a ceramic foot warmer which was claimed in time. The day of the auction was bright with enough of a breeze to keep most mosquitoes away. With 30 mins before the start, I scoured the area, taking photos of what I wished to buy, before finding my spot to watch the action. The auction began by selling items from 2 large wagons/trailers. I made my first purchase about 20 minutes into the sale when they placed half a dozen cameras on the block and started the bidding at $25 for choice. I had my eye on a Kodak 2A Folding Autographic Brownie camera like the one my husband's grandfather Noah used to take many of the photos I use on my Author Memories blog. I had checked the half dozen cameras on display and only one was the one I wanted and miraculously, it still held the engraving pen. Three magic lanterns were up for sale, but only one was complete with all accessories and slides. It sold for $150. Excuse the lack of detail in the photo but I used my iphone from about 100 ft away and then cropped the photo. Another purchase I made from this wagon was a box of old magazines - one from 1898 and half a dozen from 1936-1937, 2 calendars from 1924-25, and a binder of original photos and signed paper about the Beaver Lumber store. This box became mine when the hammer dropped on the hefty price of $2.50. Yes, I'm a big spender. Ha! 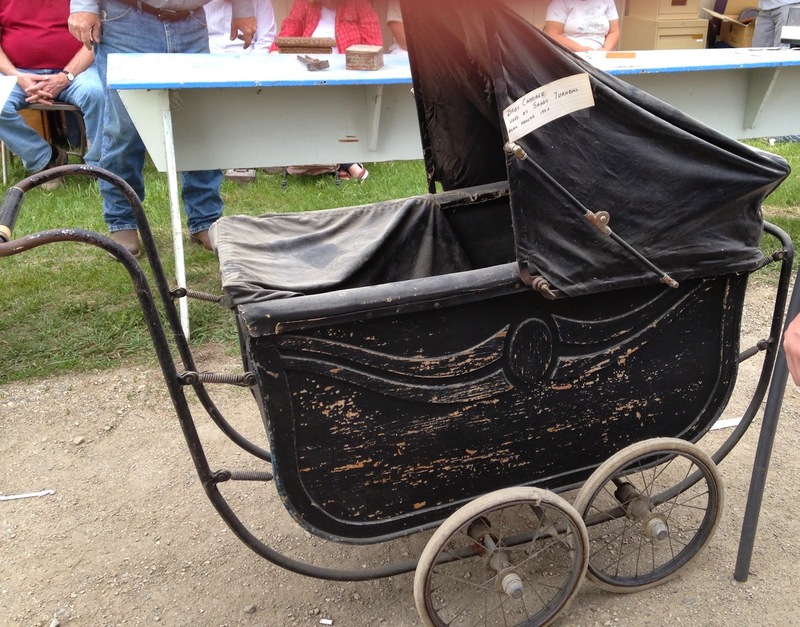 From the second wagon came this wicker doll carriage which sold for $140. 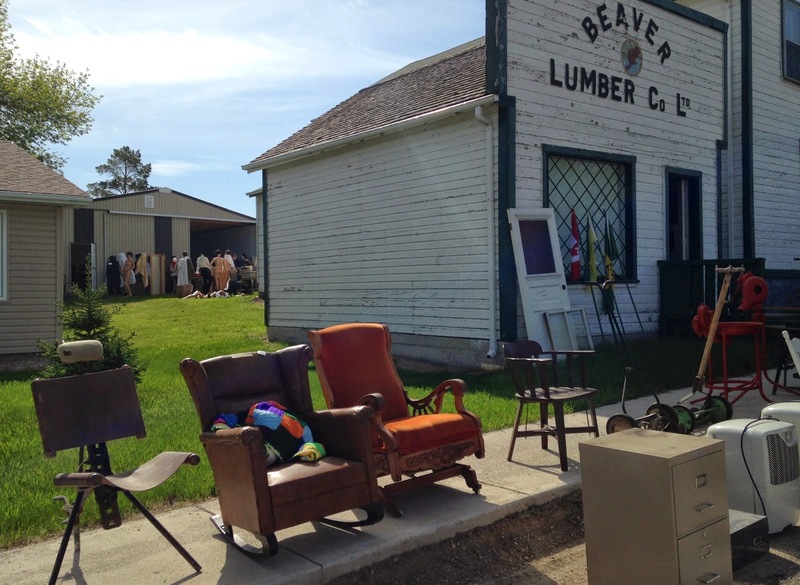 As the wagons emptied, we headed over to the items in front of the old Beaver Lumber store. 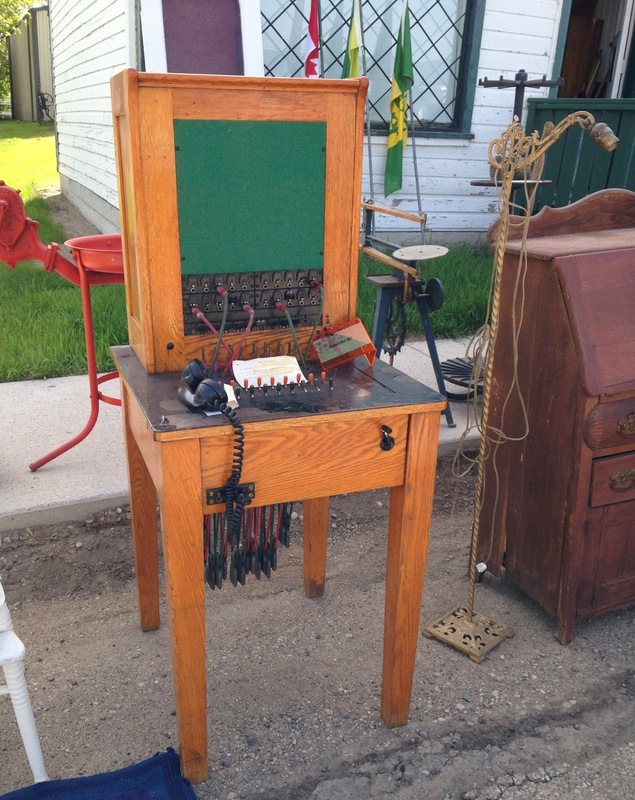 I was interested in the old telephone switchboard although I had no idea where I'd put it in our cramped little house. It sold for $110. Not far down the row came something I was VERY interested in...an original steamer trunk chock-full of items. The story goes that the steamer trunk arrived in Saskatchewan in the 1880's without its owner. Either that or she kept going and left it behind. Or maybe she died en route. No matter what happened to the owner, the steamer trunk held everything a lady could want on an ocean voyage and overland excursion. The drawers contained unmentionables, jewelry, a toilet set, stockings, etc. And the hangars held clothes. I bid up to $130 on this item and then stopped because really, what would I do with it? I had nowhere to keep it and nowhere to display it. It sold for $150. After all the front area items were sold, we moved around to the back. First up were a couple of wooden deacon benches. These were surprising to me as the first one sold for $525 (choice) and the 2nd one for $375. In the photo below, the 2nd one is being sold. I had my eye on these postal boxes for most of the day but by the time they came on the block, 2 heavy bidders went at it and I stepped back. The boxes were nice, but I wasn't willing to jump in when I didn't have the combinations and one of the bidders made it plain he'd top any amount. He got them for $55. 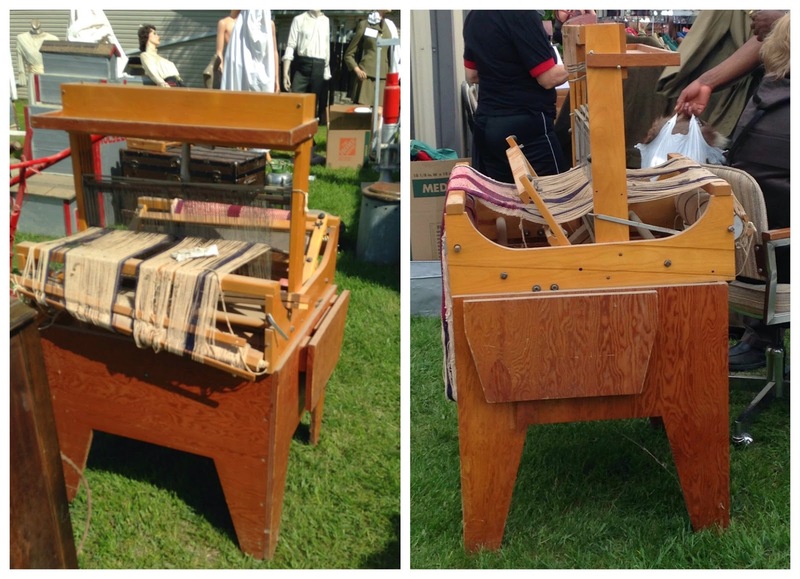 I wasn't planning on buying a loom, but my daughter has always been interested in weaving and the fibre arts, so when this table top loom with stand was going for $5 I bought it, shuttle and all. 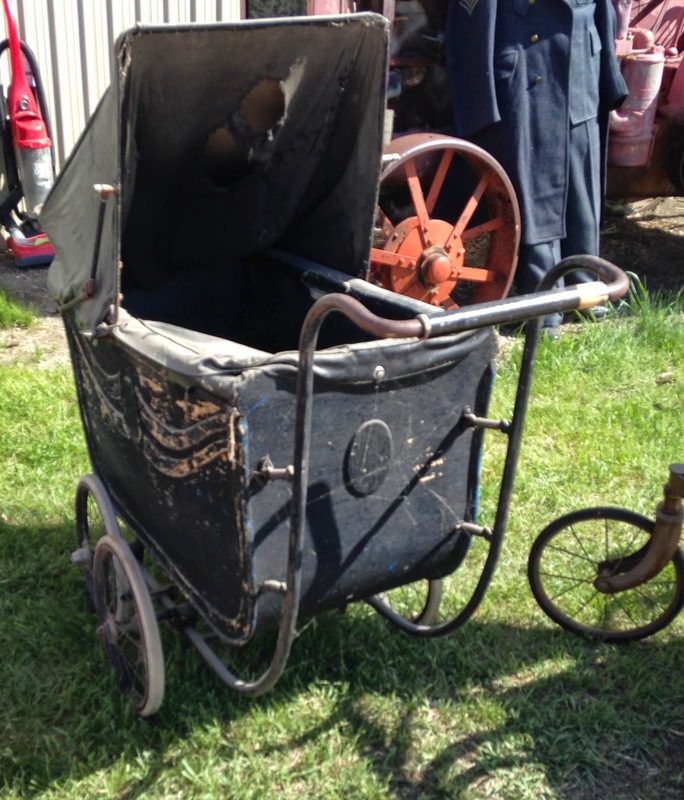 Needing a bit of TLC, this 1908 baby carriage is one of the earliest I've seen close up. It went for the price of $150. 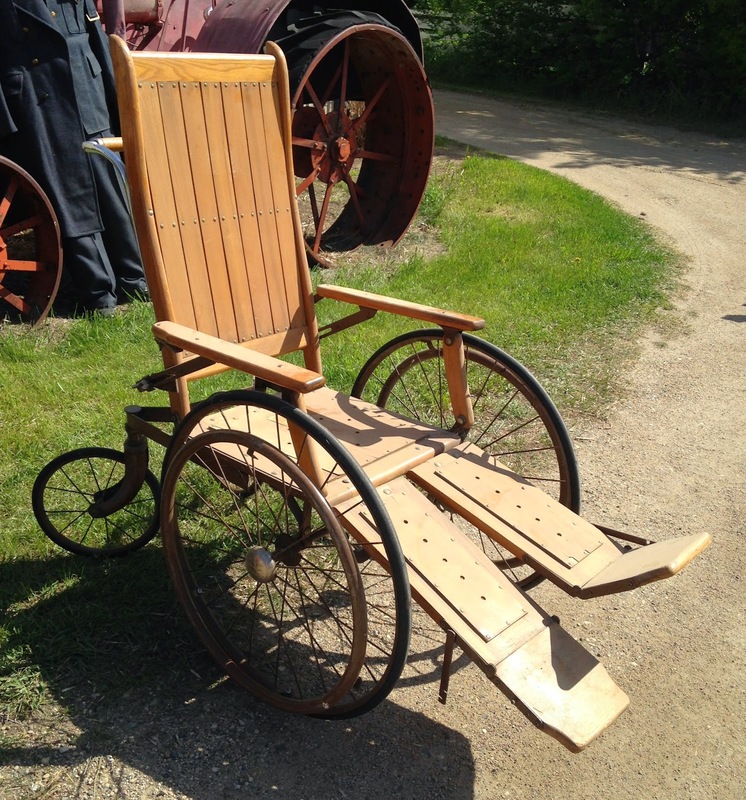 This wooden wheelchair reminded me of the one Peter pushes down the side of the mountain in the movie, Heidi. It went for $115. Dozens of uniforms, outfits, and mannequins were put on the auction block. Prices for the vintage clothing and uniforms went up to $200 with the most money going for ladies' outfits (1920-1930), WW1 uniforms, and a nurses uniform. 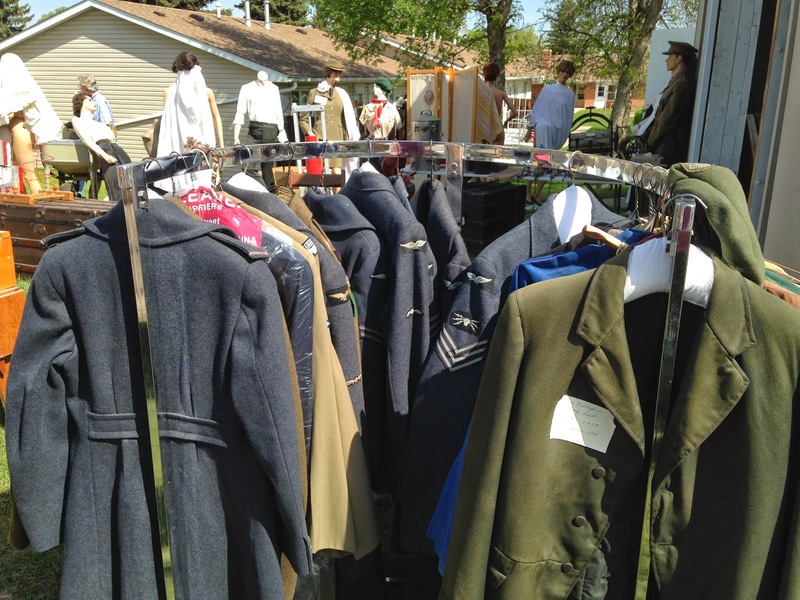 Uniforms from WW2 were well represented as was a complete vintage scout uniform and men's wear all around $100 and more. Mannequins averaged $150 each bare. Yep, that's sans clothing. Display cases were ridiculously cheap and the one I had my eye on went for only $35 but I had no way to get it home and nowhere to put it once it got there. In the same building however, I found this outfit. However, no one wanted it and it was listed as 'No Sale'. Pity because the hair dryer and curling outfit was the most unique item in the sale as far as I was concerned. Old books were sold at 5 boxes for a buck. I really wanted a couple books in that lot but couldn't imagine what I'd do with the ones I wouldn't want. Also, many had been stored in the basement and had a musty smell and mildewy look. Old wooden chairs were cheap as nails, but I restrained myself. And I turned a blind eye to dishes, knick knacks, sewing machines, wash boards, and other household goods. I'm saving some of my purchases for another post, namely photos of Queen Elizabeth (young and old) I bought for $2.50, a box of cookbooks I bought for $15 which includes recipes from the late 19th to the early 20th century, and a sorry looking side saddle and horse collar I bought for $25. Oh, and I did buy 1 box of books because it had one I really wanted - the 1912 Prominent Canadian Men and Women. Along with that box came an antique folding hangar (neat) and a handmade doll cradle (different). Auction services for the Wolseley Museum Auction were provided by www.2sauctioneers.ca. 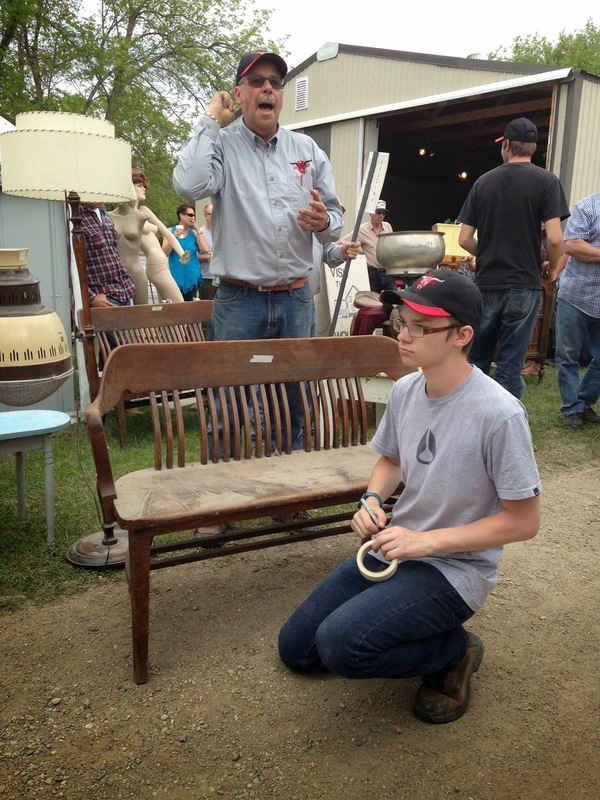 When was the last time you were at an auction? Where and what type? What did you buy? oh wow. that must have been so much fun. What great items! How far away did you have to go for that? I have my mother's wicker babydoll carriage.It needs some work and it's in the attic but it has the same frame as the big one you showed. The two small windows on the sides have fallen out but we have them. what a treasury of research items you have. Anita, I think you hit the jackpot! I have never been to an auction as an adult. But this one would have been quite the one to visit. THanks for sharing! You're very welcome. I was hoping you'd find something interesting in my post. Wolseley is about 35 mins NNE from our farm. It's the closest town if we have a hankering for Chinese Food. We bring the kids to Youth Group there. And it's also where the pilot show was filmed for the never-got-picked-up TV series, Sanctuary. I'm glad because I hadn't realized the occult topic of the show until we were on set. As it was, I played a drunk in a hotel bar - so if you ever see me on TV with a beer bottle in my hand and...a...ah...relaxed position at a bar table, remember that it was only colored water in the bottle and I was only pretending. Really. Did you say you've never been to an auction as an adult? Wow. You're missing out on some good buys. Well, unless you don't have the will power to stop yourself when the bidding gets going and you reach your limit. And I forgot to mention one other purchase... I bought a 1900 back support for $1. No one else wanted it and it's in great condition. It's one of those items that aren't spectacular unless you're into vintage clothing, etc. Wow, that's fascinating. I've never been to an auction either, but I'd love seeing all that vintage stuff. So cool! I'm sure you would, DeAnna. 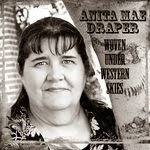 Wow, Anita! 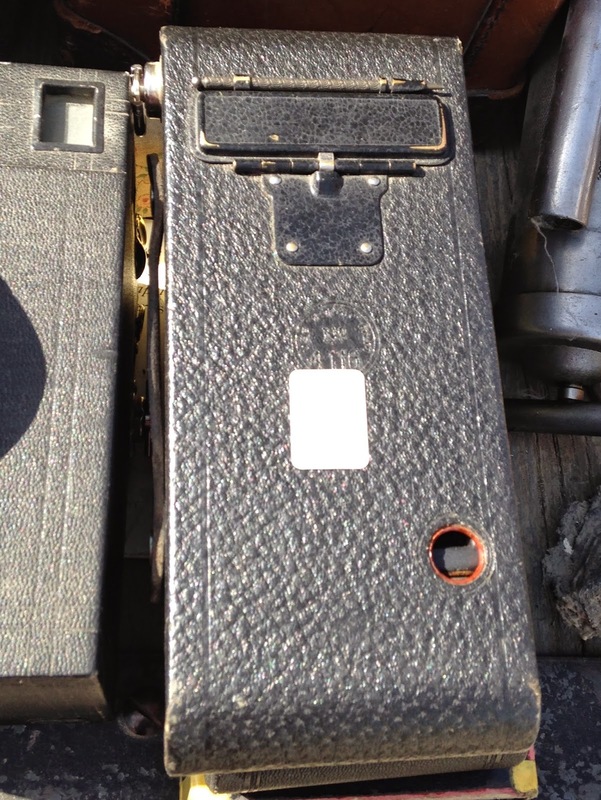 I'm super excited about your camera find. Good for you for taking the initiative. I hope to see more pictures. And I will look forward to seeing your other pictures. I've never been to an auction before. Ih wait! Many years ago when I was too young to appreciate it, a lady took me to one at Longacres in Seattle. I'd love to go to an auction near your place, Suzie. I imagine it'd have lots of water and fishing related stuff. And perhaps things from the logging trade. That's the fun of an auction, you never know what will show up. 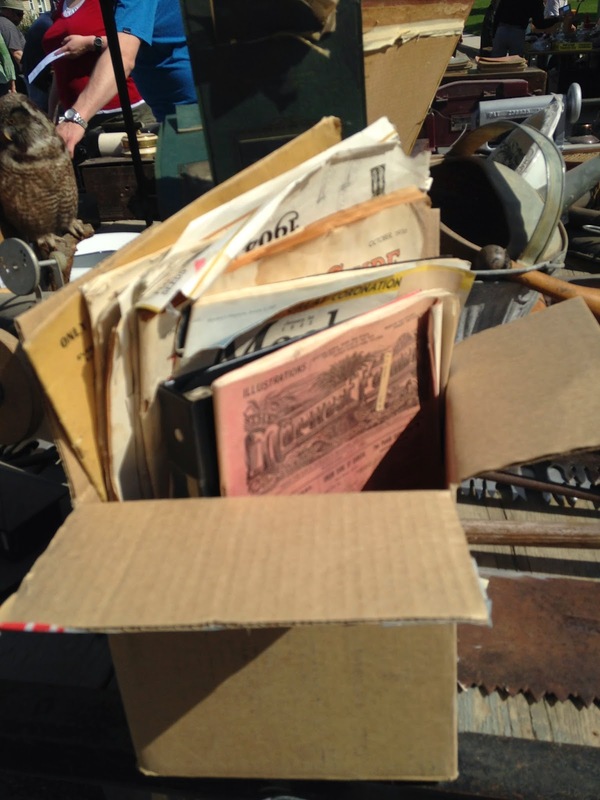 And yes, most auctions are listed on the internet, in newspapers, and in mail-outs, but each one is unique with something flavorful from the history of the area. Sometimes they don't tell you though and include it under 'small stuff' or 'household items'. 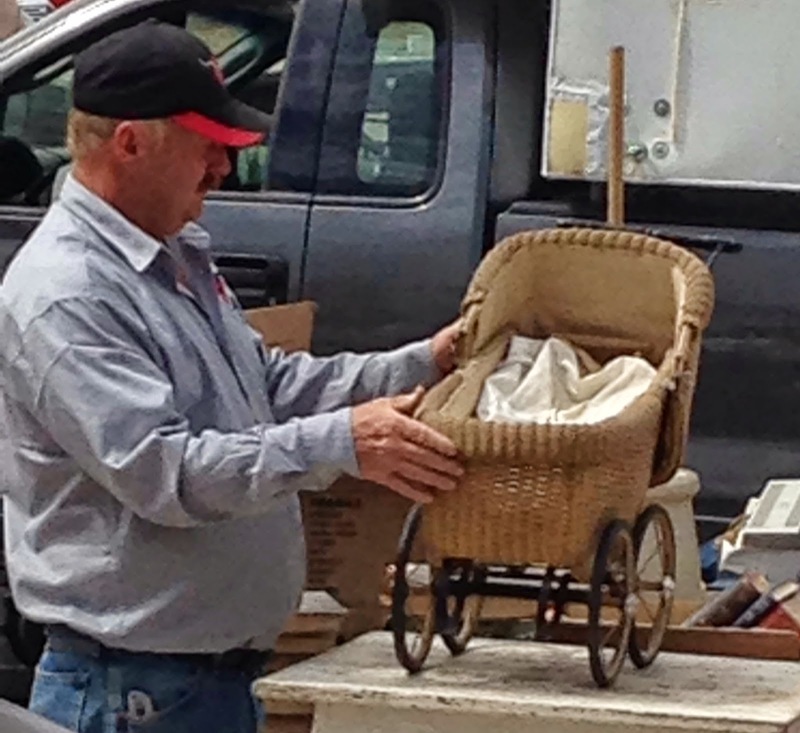 Those wagon loads they start each auction with is a treasure trove of surprise for everyone. Oh wow, Anita! I can just imagine how much fun you had looking at all those historical items. Not to mention the ones you bought. Says the girl who just finished visiting the Grand Canyon and Las Vegas. Not to mention Inky Jen. I would have loved to have been on that trip with you. Seriously, I must be getting old because I used to go to auctions and buy stuff because it was cheap - not necessarily because I had a use for it. And now I'm looking at things that I can use in my stories and my brain is saying, But where will you put it? Ugh. What amazing items were at that auction. I recognize the hair curling contraption that I've seen in other museums. I'm glad I don't have to do my hair that way! Sounds like you got some treasures!! I don't remember if it was at the Saskatoon WDM last year because I was too busy checking out the cars and riding the Bennett Buggy. And, I think we could get a curler or two in your hair. But you're smart because from what I read, those 'contraptions' as you call 'em often gave more jolts than the women expected. Or needed. Haha. Fabulous post! I love the pics. Now I'm thinking about the lady whose steamer trunk sold for $150. I wonder what happened to her. Most things at the auction had tags on them, but they didn't last with all the handling in the prairie wind. There was a tag on the steamer trunk, but it merely said it was the kind that pioneers brought when they immigrated. The info I posted was what the auctioneer read off at the time. The only auctions I've ever "attended" are on eBay. Not quite the same! You have the most fun posts, Anita! Now I want to schedule a trip to our local museum! Well, I like eBay auctions took, Niki, but they lack the adrenaline and ambiance of a live auction where the auctioneer or his spotters yell out a short "Yup!" or long "Yeah!" with every head nod, arm twitch, or 'look'. When I started attending live auctions, I'd raise my ticket number every time I bid higher, but I soon learned that once you bid, whoever spotted you first keeps his eye on you. You're his 'man' and it's his job to catch your next bid. So if someone bids against you, your spotter will catch your nod, bob, or nose tweak, and yell, "Yeah!" before looking around for more bidders. And back and forth it goes. 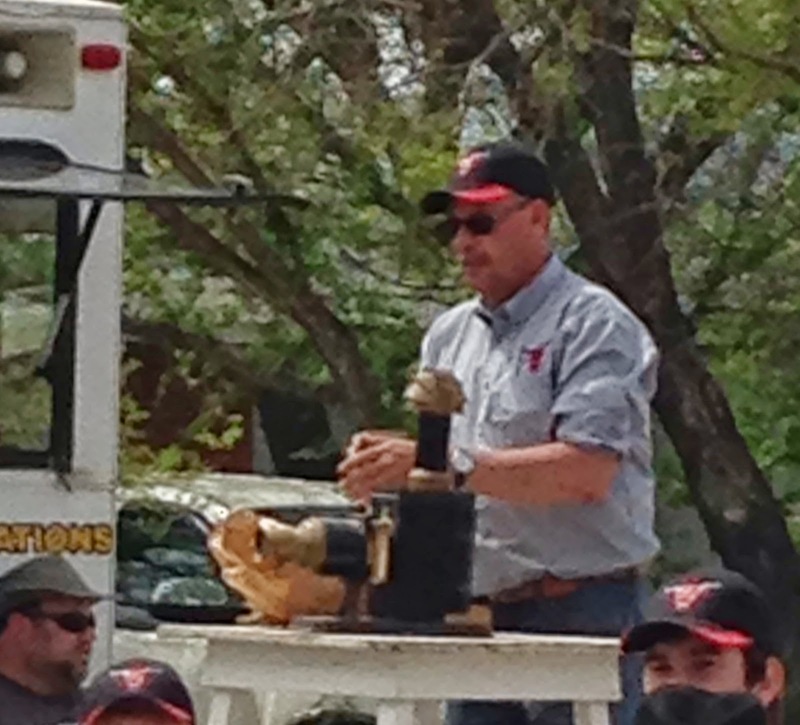 So the yells, the bang of the hammer (gavel), the wind and sun, and food smells, all add to the excitement of the day. Mind you, I've attended spring farm auctions in the rain, snow, and mud. Some of those were the best attended, too, because it was too wet for the farmers to be out in the field so they all came to visit their neighbors. Fun, Anita! We used to go to auctions when we were young newly weds living in the DC area. We discovered that dealers would outbid us on small items like vases (BTW, it's a vase if it's a couple dollars and a vahz if it's a valuable antique ) that they could put in their shop without them taking too much floor space. However, we could often outbid what dealers wanted to spend on large items that took up precious floor space in their shops. (I nearly cried the day an antique oak sleigh bed couldn't get a single $100 bid. I lived in an apartment at the time and had no place to store it or else I'd have taken it.) And if it was a really nice Sunday afternoon when the Redskins were playing? Things went for a song. Hence, Chez Chase is furnished in Early Modern Auction, which cost us less than buying new. And the cool thing is all that furniture just keeps getting older -- which is a good thing in an antique. Some things we've had reupholstered, but it's cost effective if the piece itself is still worth more than the reupholstery costs. If we'd bought new all those years ago, that stuff would have been worn and outdated (and probably thrown out) by now. All the equipment on our farm was bought at farm auctions and I'm very glad because we couldn't have afforded it new, and if we had, we'da been in serious trouble with bills because we only farmed 5 yrs before my city-boy hubby decided farming wasn't for him. We now rent out our land and since our eqpt was rusted to start with, their wasn't any loss to speak of. Out here the auctioneers don't bid unless no one else shows interest. Or the bid is so low that it's better for the auctioneer to bid and give the owner a decent price for his stock. But at any auction I've been to, I've only seen half a dozen items - if that - go to the auctioneer(s). Now we don't know if he has someone in the crowd buying for him, but most auctioneers here don't even have shops. Now, the city ones are a different group and Nelson won't let me go to those anymore. heh. This museum crowd included many buyers from other area museums. So if I knew a certain person was bidding for an item that would end up in a museum I was familiar with, I passed on the item. It just didn't seem fair otherwise. Especially with my lack of space. And I know exactly what you mean about that sleigh bed. Oh, do I ever. Years ago I passed on a $20 hoosier - top, bottom, flour funnel, etc, because I was 2 hrs from home and the hoosier had to be gone by that night - and of course they didn't sell it until late afternoon. I had my Mazda 1/4 ton, but I was only there to buy a cement mixer that we needed to mix our potting soil mixture for our greenhouse. And because it was a big old cement mixer in a little truck, there was no spare room for the hoosier. I still regret that.